Happy Friday everyone! 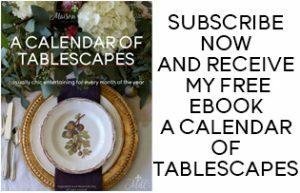 If you’re a regular reader, you know that on Fridays I usually do a “Friday Favorites” post, however, I have something special to share with you! Instead, I’m joining some blogging friends to bring you a Room Transformation blog hop! And if you’re coming here from Meme Hill, welcome. We hope that our stories of renovating, re-doing, or simply refreshing a space will inspire you and give you ideas for your own homes! 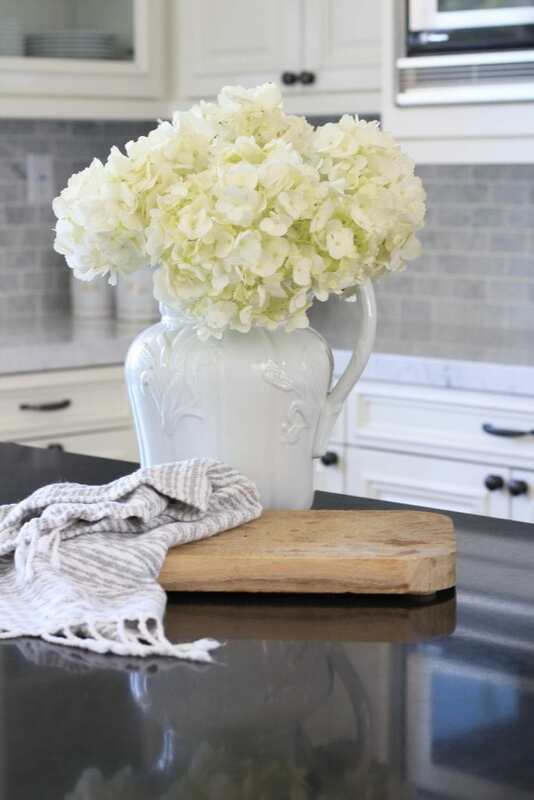 Today I want to share a farmhouse kitchen renovation story that’s close to my heart. This kitchen belongs to a friend and was one of my first design jobs. It all started with a phone call that went something like, “How would you feel about coming over and helping me with my kitchen renovation? I just need some advice on some specifics, like the size of the island, and an opinion on paint colors.” She wanted to update her dated kitchen to a white farmhouse style. To me, a white kitchen die hard, that was a no-brainer! Cut to a few months later, and I ended up helping her with the whole project. We took what was once a dated Tuscan-style kitchen stuck in the late 90’s to the gorgeous farmhouse style beauty it is today! So let’s start with the BEFORE, since that’s always so fun! Here is the kitchen as it stood before we started our farmhouse kitchen renovation. Other than painting the cabinets once, it hadn’t been touched since 2002. The style was the epitome of the “Tuscan” look that was so hot at the time. 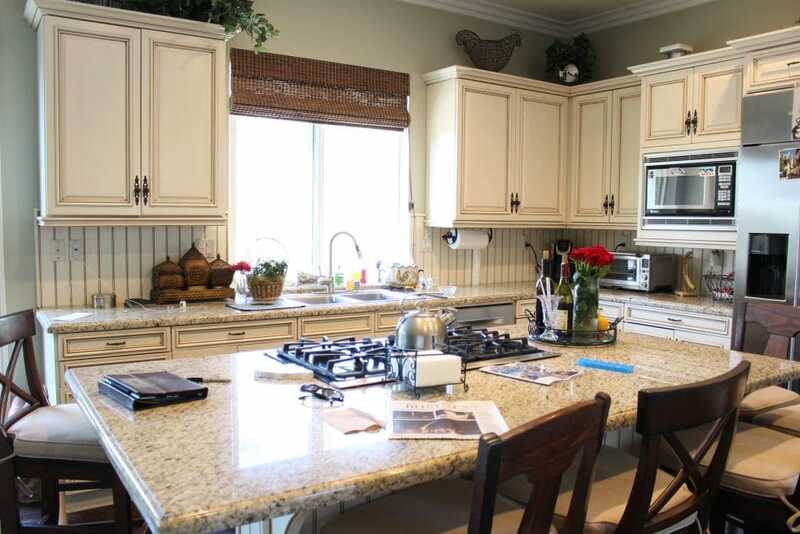 Glazed cabinets, beige busy granite, and Tuscan style accessories was where it was when I came over to meet with her. Two of my client’s biggest complaints were the beige-y brown glaze color of the cabinets, and the fact that there was a space between the cabinets and the ceiling. And I agreed. Those spaces are not only big dust collectors, but a huge waste of unused storage space. Not only that, you’re forced to spend money to accessorize them, which only makes those items collect even more dust! Another thing she was excited to fix was the fact that the island was kind of small for the space. They are a family that still has a child at home, and because her cook top is on the island, it was difficult to cook and have room to also sit and eat dinner. As this is their main everyday dining space, she wanted to expand the island to reflect that. Overall, the kitchen has great bones in an open concept layout with the family room just adjacent to the left of this photo. Unfortunately, it was stuck in the “Tuscan” decor period, with fussy details and dated colors. It just needed some updating. She wanted a clean, white, farmhouse inspired kitchen, and I think we achieved it! And the farmhouse kitchen renovation AFTER….. The first thing we did was add cabinets to extend them all the way to the ceiling, and add glass fronts. 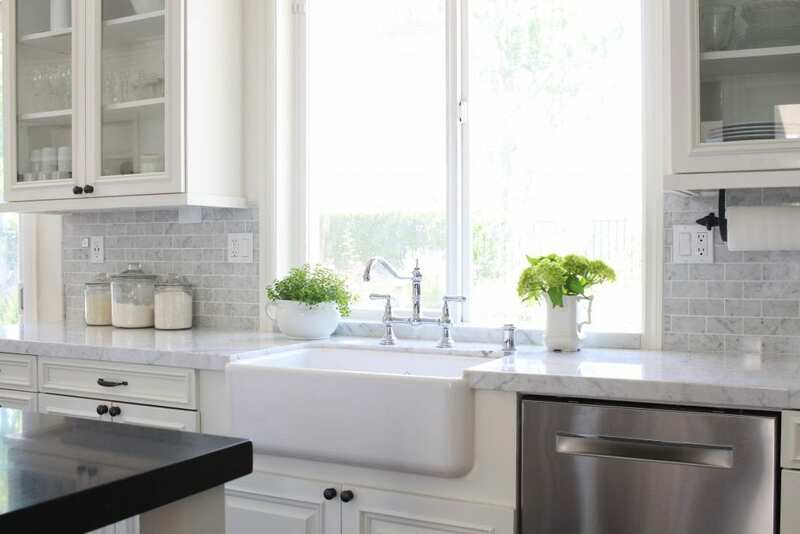 Adding the glass there, as well as to the two cabinets on either side of the sink really add interest and charm. It’s one of my favorite things! We also painted them all a crisp, clean white and took off that bottom molding to give them a cleaner look. Even that made such a difference! 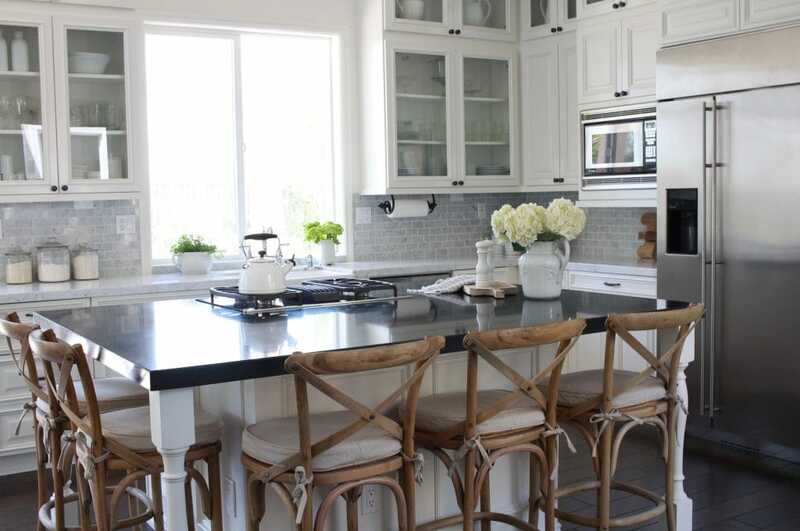 The island was enlarged, as well as had the base re-built with new paneling on the sides and new farmhouse style legs. 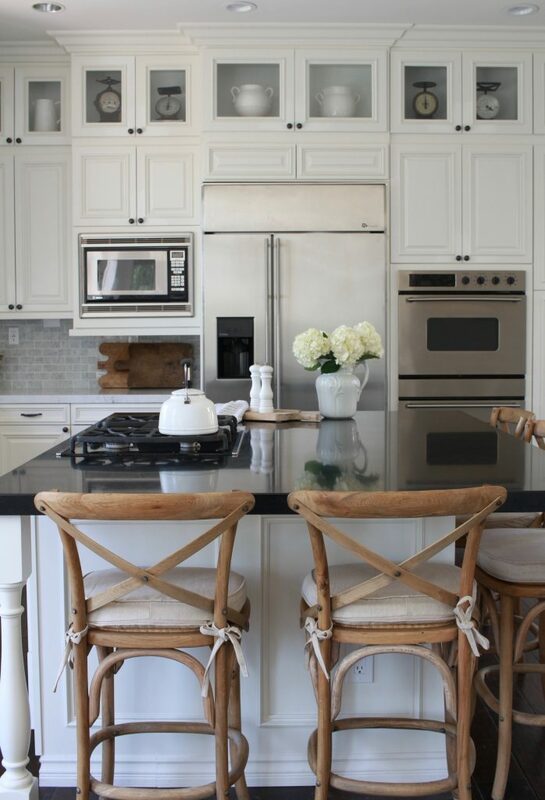 How adorable is the marble tile backsplash?! I love it! So much so that I wish I would have done it in my own kitchen! 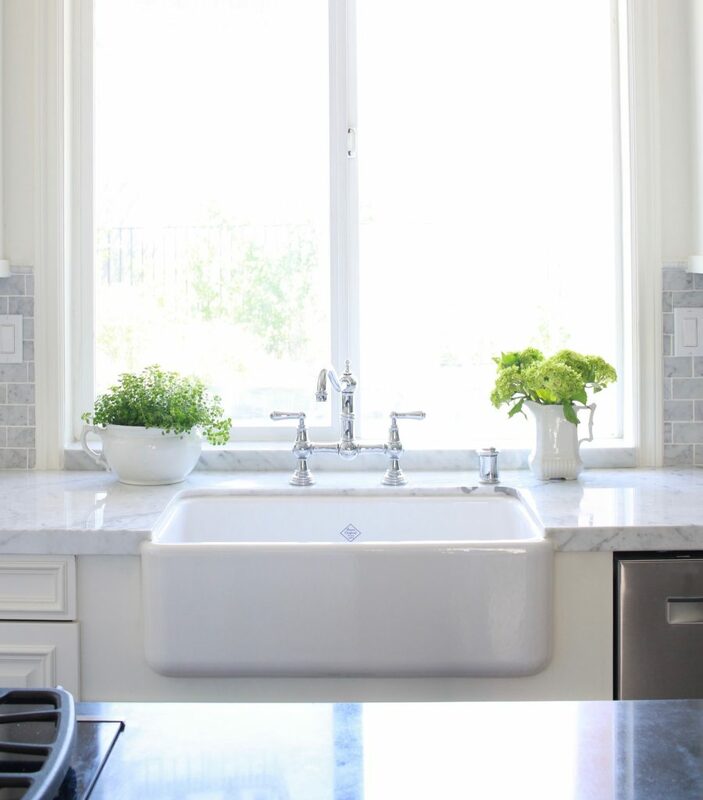 We installed white carrara marble on the surrounding counters, and she chose a farmhouse sink. The marble is a straight cut to stay with the “clean and simple” look we had in mind. Cabinet pulls were switched out as the former ones were pretty detailed and a little too fussy for her. These are oil-rubbed bronze and clean and simple. 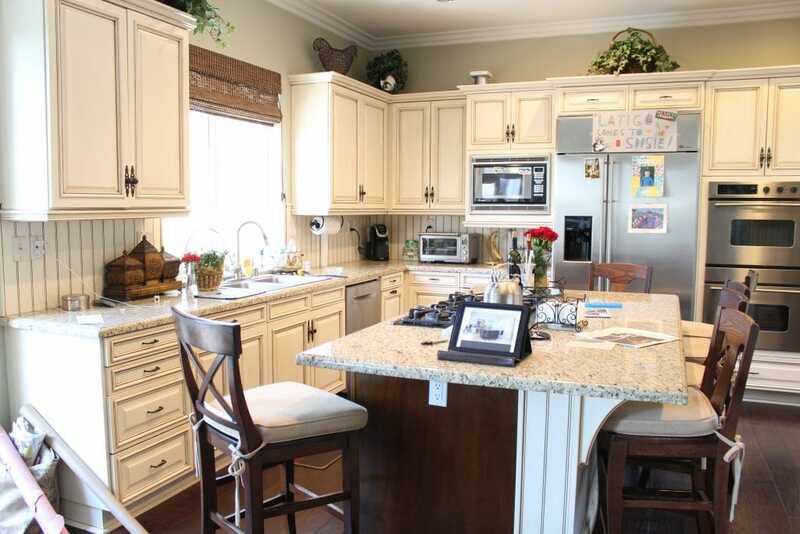 We saved money by using the existing cabinets, and even part of the existing base for the island. The cabinets that were added were stock that matched what was already there. Her appliances were in good shape and pretty, so those stayed. Also, carrara marble is probably the least expensive white marble out there so it wasn’t too much of a splurge. She also wanted to change the existing barstools. They were too dark of a wood, and she didn’t like them enough for us to paint them. These x-back chairs are charming and practical, and I love the texture the natural wood adds to the space. We’re still working on the accessories! Adding white ironstone, French wood cutting boards, and some vintage scales has added character and interest to the space, but we still need a little more. We’ve found a lot of the scales and ironstone at local antique stores, but I’ve also found some cutting boards and a scale on Etsy. And she was lucky enough to travel to Paris recently so some of the cutting boards came home with her! 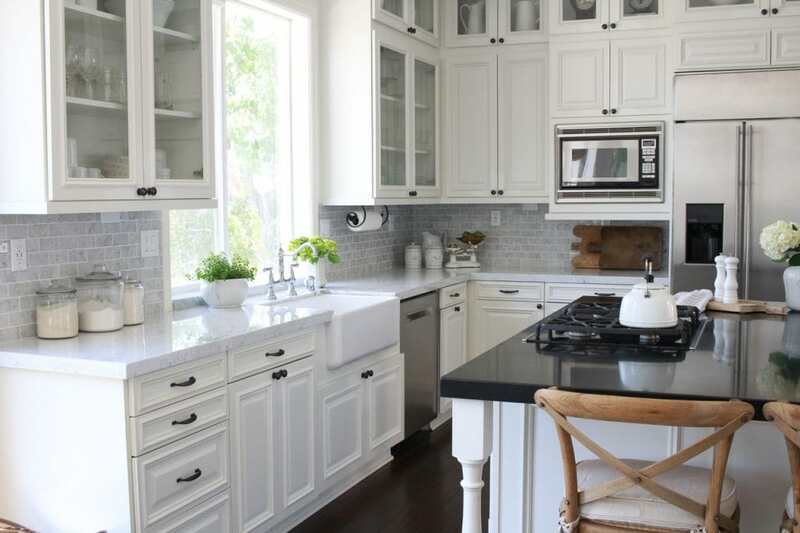 The new added upper cabinets are filled with the black vintage scales and simple white pitchers from Home Goods. When we find more ironstone, we will swap out the Home Goods pitchers for the vintage ones. I’m so happy with how this farmhouse kitchen renovation turned out, and more importantly, so is she. It’s given a much-needed face lift to the room and brought it into this decade. Hopefully this kitchen remodel will last another 15 years or more, and be a space for her family to gather, eat, and make memories. It has meant so much to be a part of this project. To me it’s an honor to help a family make their space their own, and I have truly enjoyed it. Obviously, some of the items are vintage, but I’ve sourced some similar ones (both new and vintage) if you want to get a similar clean, farmhouse look! What a change. You wouldn’t know it was the same kitchen. Great job. I like the space above the former cabinets because I have cats and it’s the only safe space left to decorate ! That’s so funny because I used to have cats, and I remember flowers were for sure out (along with some other items!) haha! Thanks for stopping by and for taking the time to leave a comment! So appreciate it! Thank you Pernilla, I appreciate that! It was such a labor of love and to know that it has connected with people means so much! This looks fabulous Sheila! Simple changes that made a world of difference! Sheila this is an absolutely beautiful remodel! I love all of your choices! So clean and chic yet warm and cozy! Great job!! Thanks so much girls! Chic and cozy is what I was going for – so I’m so glad you think so! What a great transformation! It doesn’t even look like the same space! What a beautiful transformation! I love the white marble, and the black too! 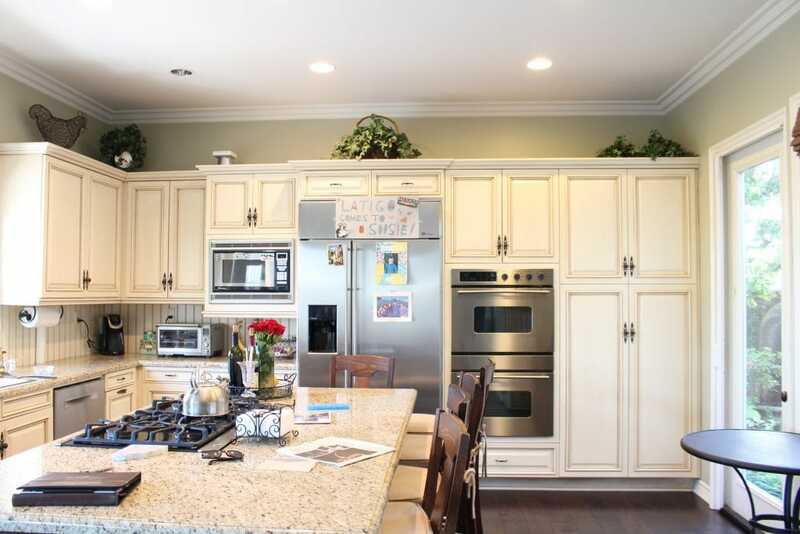 Love how you brought the cabinets up to the ceiling and added the pitchers and scales. This looks so farmhouse chic! Amy, I love your comment! 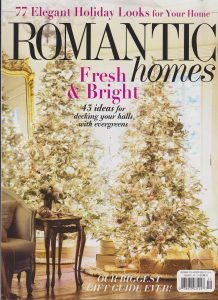 “Farmhouse chic” is exactly what we were going for! It was my client who wanted the punches of black and I think it fits the space really well. Thanks for stopping by and for your sweet compliments – I truly appreciate it! Sheila, what a gorgeous transformation… I absolutely love the addition of the top storage..brilliant! The marble is stunning and love that you changed the backsplash too, you are right, it is so gorgeous! And who doesn’t love a farm sink?… great job my friend ?????? It was such a labor of love and I feel so honored to have been a part of it. Thanks for stopping by sweet friend! Sheila, This kitchen turned out beautifully. 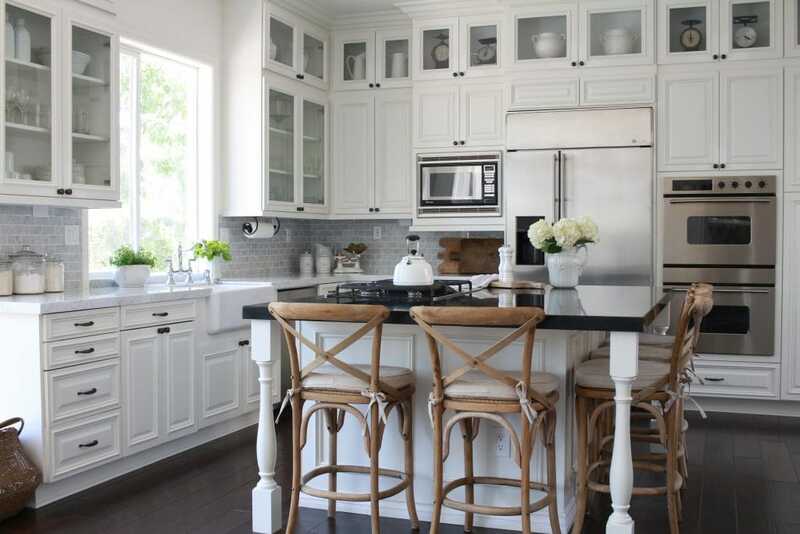 I love the idea of adding the cabinets on top and with glass, it really adds a lot of charm to this farmhouse design! You are so clever in design!!!! Beautiful job! Thanks so much Joan! I just love those glass front cabinets, too! I appreciate your sweet compliments, and am always so happy to be “hopping” with you! Hi Sheila! Im a big fan of double stacking cabinets! Great job and her collection of scales are highlighted perfectly! I have those same stools and chairs! Hi! Love it Sheila! My fave part was adding the glass ceiling cabinets ….!!! Bet Susie is so pleased with the changes! Mine too! The glass just adds so much charm and character! She does love it, which makes me so happy! Wow, what a great transformation and remodel! I love all the choices and my goodness the new farmhouse look is spot on and beautiful! The marble back splash tile is fabulous, and maybe I’ll try that in a laundry room remodel! 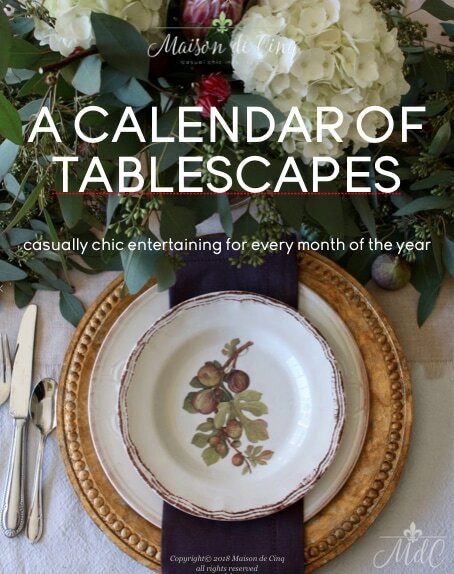 Thanks so much for such an incredible post and also, for joining us on this July blog hop! Thank you Janine! I love the marble tile, too! She wanted that from the beginning and I think it’s a great choice. It would look wonderful in a laundry room – I think you should do it! Thanks again for hosting our hop this month! Love doing these with all of you, and I am so honored to be with such a talented group! Sheila, this kitchen looks amazing! Your friend must be thrilled with the changes. 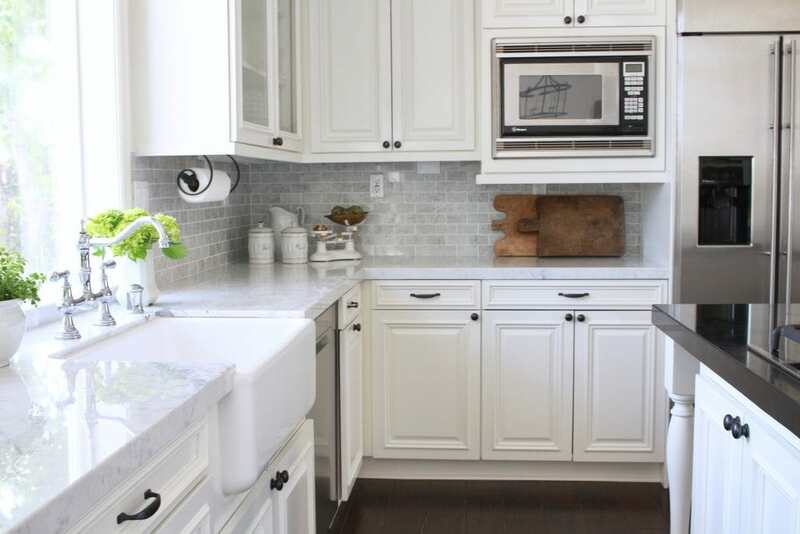 I love how you extended the cabinets and added that gorgeous subway tile! Beautiful! She is really happy Shelley! After all, it had good bones, it just needed a refresh (kind of like me:)) And I agree, extending the cabinets and the glass front doors are my favorite parts! The kitchen looks fabulous! I love every detail! ??????? What a wonderful job you did on this kitchen, Sheila! I love how clean, elegant and fresh it now feels. And the wood touches really add to the textural appeal! So very pretty!! Thank you Kathleen! It really turned out just how she was dreaming of. And I love your chairs, too! Popping over to your RV makeover later – can’t wait! 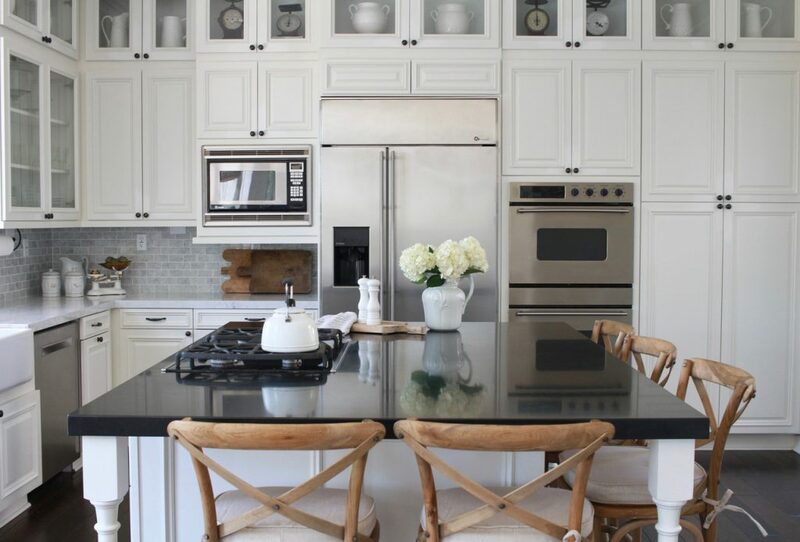 I love what you did , i have almost the same kitchen, m’y cabinets are thé same col our. What is the technic that you use to paint them? They were spray painted by a professional painter. Hope that helps!